Castle Drogo was designed by one of Britain’s most famous architects, Edwin Lutyens. 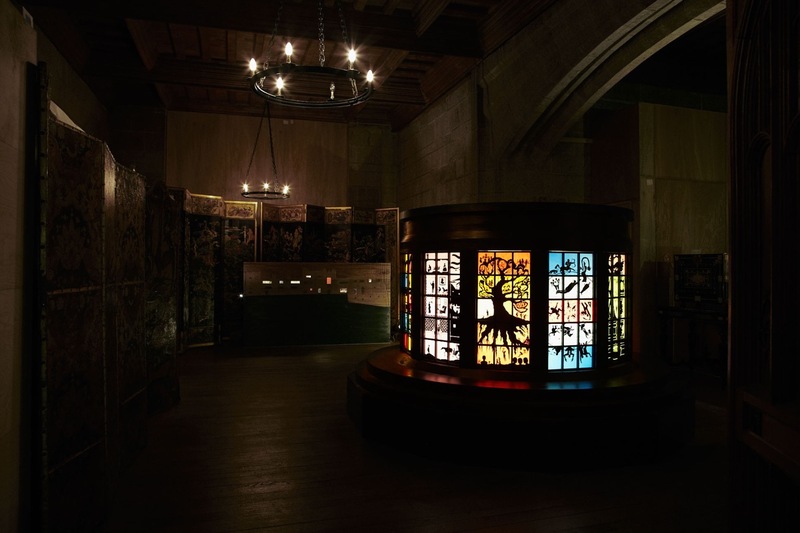 Taking as a starting point the roof lantern above his kitchen at Castle Drogo in Devon, UK, this artwork examines the story of his client Julius Drewe, once the richest man in Britain, as an archetype of rise and fall. Each panel explores a moment in his life story told through allegory and metaphor, ranging from Greek myths to 1001 Nights, 20th century rapacious capitalism to the Fisher King. Each illuminated panel narrates a story related to ideas of change and mutability (socially, economically, politically), considering 20th century social progress, and whether today’s increasing discrepancies in wealth distribution and social rights are a long shadow of feudal-esque, pre-WWI Britain. The pattern of squares and the circular form allow the work to be read as a diagram or system: allowing repeats, refrains, variations; bringing out analogies and echoes; and forming a chequerboard of images rich with histories and interpretations. It makes reference to gridded artworks such as: medieval cathedral altarpieces, Italo Calvino’s diagrammatic novella The Castle of Crossed Destinies, and snakes & ladders boards (originally Indian mystical diagrams of fate and chance). Grade I Listed Castle Drogo is undergoing extensive conservation efforts. By inserting symbols of activism and progress into a replica of this Establishment artifact, alongside elements suggestive of recalcitrant attitudes to change, the installation questions patriotic conservatism’s dominion of national heritage.